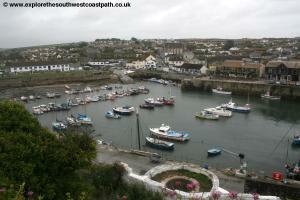 This walk begins from the attractive town of Penzance in the far south west of Cornwall. 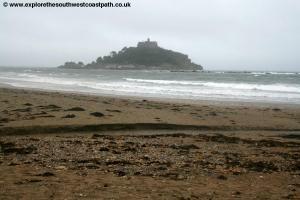 The walk is initially easy, following the tarmac path along the sweep of Mounts Bay, passing the famous St Michael's mount. 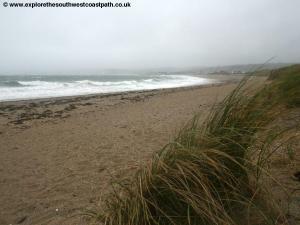 From Marazion we briefly follow roads but soon rejoin the cliff top path to Perranuthnoe and the find sandy beach of Perran Sands. 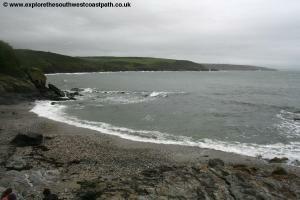 Rounding Cudden point we continue to the second sandy beach, Praa Sands and on around Trewavas Head to the attractive town of Porthleven. 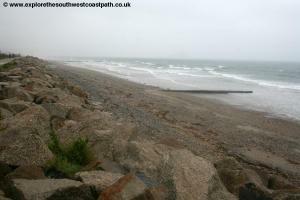 Penzance is situated just off the main A30 road from London to Lands End. 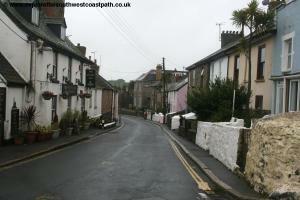 As you approach Penzance from the east the road briefly widens to a dual carriageway. At the the first roundabout continue on along the A30. At the next roundabout take the first exit to Penzance and continue along this road to the railway station on the left. There is a car park at the railway station (which is adjacent to the bus station) which is at the time of writing the cheapest car park in the town centre. Just beyond the station is a large car park next to the harbour. If you are travelling by public transport, Penzance is well served by both train and bus links. By train there are broadly hourly trains from Plymouth, via the major stations of Liskeard, Bodmin Parkway, Par, St Austell, Truro, Redruth, Camborne and St Erth. Most trains continue east of Plymouth to Exeter and then on to London or the Midlands. As well as long-distance trains on the main line there are also some services to St. Ives although usually you have to change at St Erth. There are frequent buses to Penzance from St Just, St Ives, Hayle and also from further afield including Falmouth and Truro. For details of bus and train services in the area see the link below. 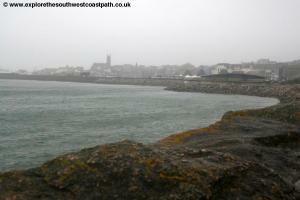 This walk begins from Penzance railway station which is also adjacent to the bus station and the large harbour car park. From the railway station head through the railway station and on to the bus station. Cross and take the signed footpath along the harbour front. You need to be on the coastal side of the concrete wall you can see ahead. 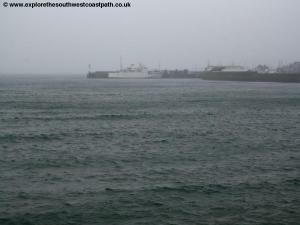 You now simply turn left, keeping the sea on your right and follow this wall for most of the way round Mounts Bay. At the opposite end of the bay you can see St Micahel's mount which we pass later in the walk, which gives the bay it's name. 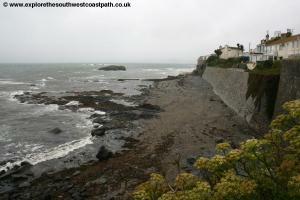 The walk is initially on a combined footpath and cycle path that runs along the sea wall with the railway line immediately to the left and the A30 just beyond that. Some of this area is reclaimed land that houses the areas main transport infrastructure as well as several supermarkets. Mounts bay itself is a good sandy beach (although with some shingle in places) and despite it's proximity to the town it is usually very quiet, perhaps as a result of the slightly awkward access. After around half a mile you pass the Heliport. From here a passenger helicopter service operates to St Mary's and Tresco, two island that make up the Isles of Scilly, although the heliport here is planned to close next year (2012), which will relocate to St Erth and a new Sainsburys be built in it's place. Continuing you soon pass the Long Rock train depot on the left, where the sleeper train that runs from London is usually located during the day. Just beyond this point the path opens up into a little car park which you walk through and continue on the main surfaced path, still adjacent to the railway line. On the opposite side of the railway the light industry of Penzance now gives way to residential properties that make up the village of Long Rock. Soon you come to the site of the old railway station where there is another large cafe and car park. 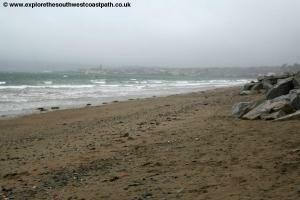 Walk through the car park and from here we have to follow the road to and through Marazion. Sadly there initially isn't a pavement and a little marked area by the side of the road is used as car parking, forcing you at times into the edge of the road, so take care. Soon this layby area widens providing ample room to walk without walking in the road.. Ahead sand dunes soon start and here you leave the road to take the wide footpath through the dunes. 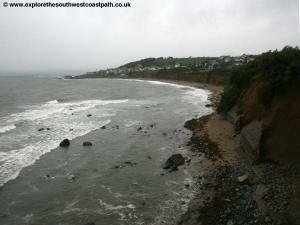 As an alternative if the tide is out you could instead walk along the beach. Ahead you come to a little stream that flows out from Marazion Marsh, and a footbridge is provided parallel to the road to enable you to cross. Continue on the path along the edge of the large grass car park beyond the bridge, keeping as close as possible to the beach. Continue past a little boat yard and on to another little car park Here you need to join the adjacent road, Kings Road which you follow until it joins the main road through Marazion by the Godolphin Arms. The slip way just to the right here privodes low tide access to St Michael's mount along the stone causeway, but this as covered at high tide. At high tide a ferry operates (subject to the weather) and the little island is well worth exploring although to access most of the buildings you will have to pay an admission charge (National Trust). 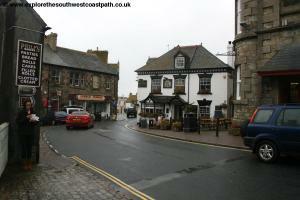 To continue the walk keep to the main road as it opens into the square with the Marazion Hotel and beyond the Kings Arms. Keep going along the main road, Fore Street, which soon becomes Turnpike Hill and then Turnpike Road. 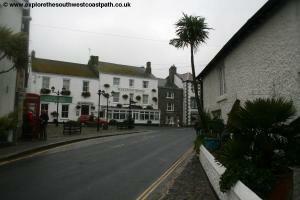 Soon the speed limit on the road increases to 40mph as you leave Marazion. As you come to Trevenner Lane on the left (a residential street), turn right instead on the second of the two tracks, where the coast path is signed. Follow this as it comes to a large house (keeping a little to the left) and continue on the now narrower track signed for Venton Farm. Soon you rejoin the coast, passing the farm on your left. 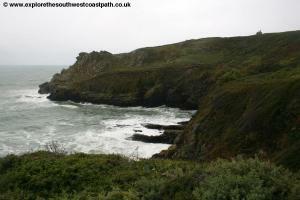 For the next mile or so the walking is easy, you simply keep to the main track along the cliff top, with the low cliffs on your right. Looking back you have fine views of St Michael's mount behind you and soon the little rocky island of the Greeb to your right, where you round the little rocky bay. 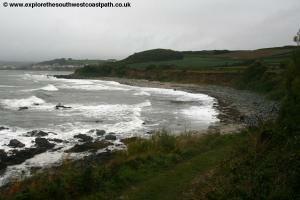 Continue past Maen-du Point and as you round this point you come to the fine beach of Perran Sands. This is a quiet little beach, accessed only from the western end of the beach at the time of writing, on the road down from the nearby village of Perranuthnoe. Here the path heads briefly away from the coast and joins the road which if you turn left takes you to Perranuthnoe or to the right to the beach. 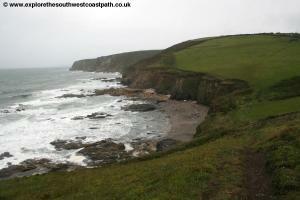 Here take the minor road slightly right of straight on, marked with a wooden coast path sign. As the road splits, take the right most fork by a house and just by the back of the house turn right again to rejoin the coast. You now follow the low cliff path along the top of Terbarvah Cliff. 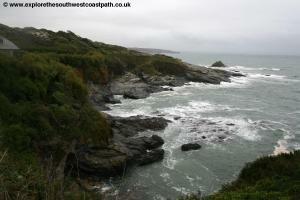 This is a pleasant and fairly easy coastal walk for the next mile and a half as you round the rocky coves of Tervan Cove and Stackhouse Cove. Soon you come to the headland of Cudden Point. 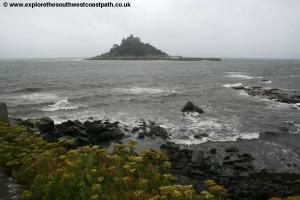 This is your last change to enjoy the view of St Michael's mount as we soon round the headland. Rounding the headland we now turn from south to east and soon pass the little beach of Piskies Cove. This is a rocky beach, but there is some sand at low tide. 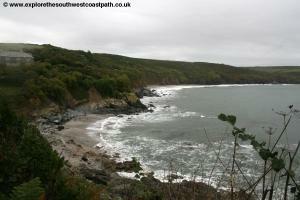 Just beyond this cove you come to Prussia Cove. The area is named after the 18th Century ship wrecker and smuggler John Carter who was also known as The King of Prussia. 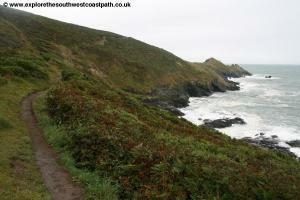 As you reach the cove the path joins a wide track which you follow to a junction ahead where you turn sharply right on the wide track that passes some of the houses on the little private estate here. Soon the path narrows back from a track to a footpath as you past the last of the houses and come to the fine sandy beach of Kenneggy Sand. 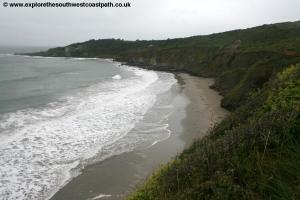 The path runs along the low cliffs at the back of the beach, but there is a path down to the beach to. 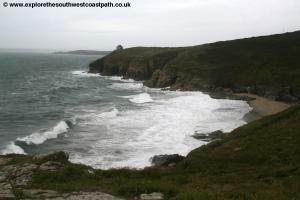 Be aware that if you take this path it is the only access to and from the beach so you need to rejoin the coast path here to continue the walk. 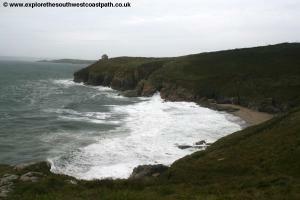 From Kenneggy Sands you continue on the path along the low cliffs for another half a mile or so until you come to the wonderful beach of Praa Sands. Here you'll find toilets, a cafe and even a surf school. 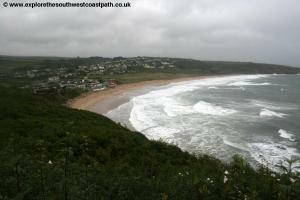 Praa sands is a fine sandy beach around a mile long and despite being on the south coast is known for it's surfing. 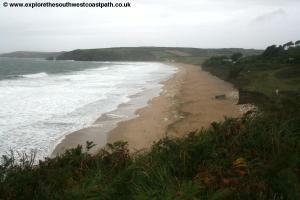 From Praa Sands follow the path in front of the surf shop and cross the little footbridge over the stream that flows onto the beach. Continue along the path passing the cafÃ© and into the car park. Keep going through the car park and into the adjacent field (which is also the overflow car park) and follow the path along the cliff top behind the dunes, over Praa Green. At the end of the green there is a small area of heathland behind the dunes. Â Here turn left then almost immediately right along the path through the heath area, ignoring the path down to the beach itself. Instead keep to the path heading east through this area, which soon turns to the left away from the beach and comes onto the private road. On reaching this road turn right and follow it until you reach the last house on the left, where it becomes a public road. Opposite this house turn right on the road and then take the coast path signed off to the left through another area of heathland behind the dunes and beach. Keep on this path as it runs right along the back of the beach and at the eastern edge of the beach then begins to climb up along the low cliffs. Follow the path heading east and when the path splits you have a choice. 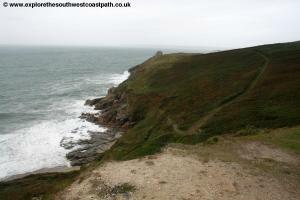 The official route is with the main track to the left which soon joins the road to the car park at Rinsey. Head through the car park and continue east to the old mine house. An alternative route there is to instead take the right hand fork and follow it until it crosses the track leading to Rinsey Head and then keep ahead. 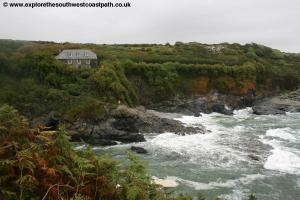 The house you can see on the headland is in private ownership but is rented as a holiday cottage or film location. 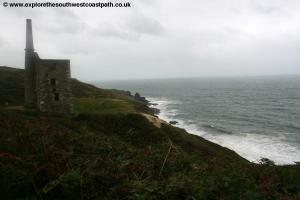 The path comes to a junction where you turn left along the track to the old engine house. 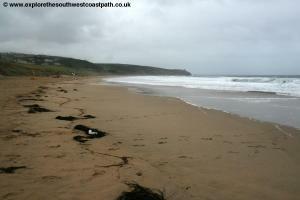 A path off to the right leads down to Porthcew beach. 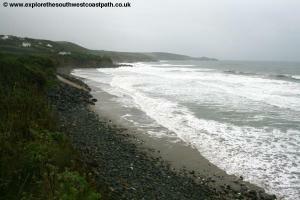 This is a lovely quiet and sheltered sandy beach although at high tide the beach is covered. From the engine house on the cliff top take the lower of the two paths over the cliff top, now an area of heather and gorse. 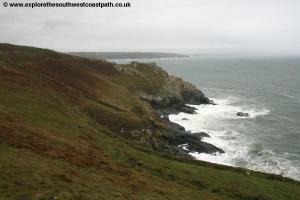 Soon you reach the next headland, Trewavas Head where you keep with the coast path now heading east. Keep to the main coast path heading east passing behind several more old engine houses and the remains of some old mines. You pass the landward side of the engine houses in the little valley, a reminder of the industrial heritage of Cornwall, and the ruined towers are a classic Cornish scene. The path continues on the cliff top and soon zig-zags down the steep valley at Trequean Cliff, and climbs back up the other side. 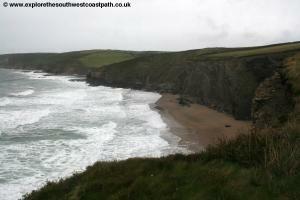 Continue east on the main and well signed coast path soon going through another little valley and then following the low cliffs behind Porth Sulinces beach. 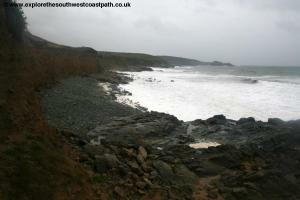 This is another lovely sandy and rocky beach. 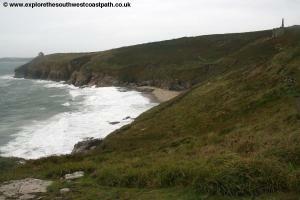 Keep to the path along the low cliffs at the back of the beach and shortly to another even smaller beach, Parc Trammel Cove. Beyond this cove the path continues right along the cliff top and soon passes a single house just to the left. 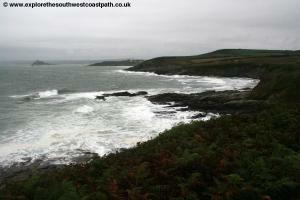 Continue on the main path as it soon widens to a track and then a road, Ocean View. When this comes to a road junction ahead turn a little to the right along Mount Pleasant Road as it descends to the harbour at Porthleven. 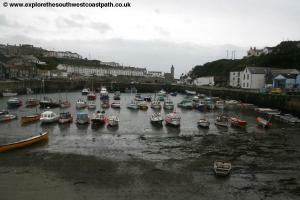 Follow the harbour wall heading north to the main green in Porthleven, where the walk ends. Bus service 2 and 2A, operated by First Devon and Cornwall runs hourly from Porthleven back to Penzance Monday – Saturday and once every two hours on Sunday. For details of this and other services in the area, please see the link below. Ordnance Survey Landranger maps 102 and 103 cover this area and are available locally and nationally.